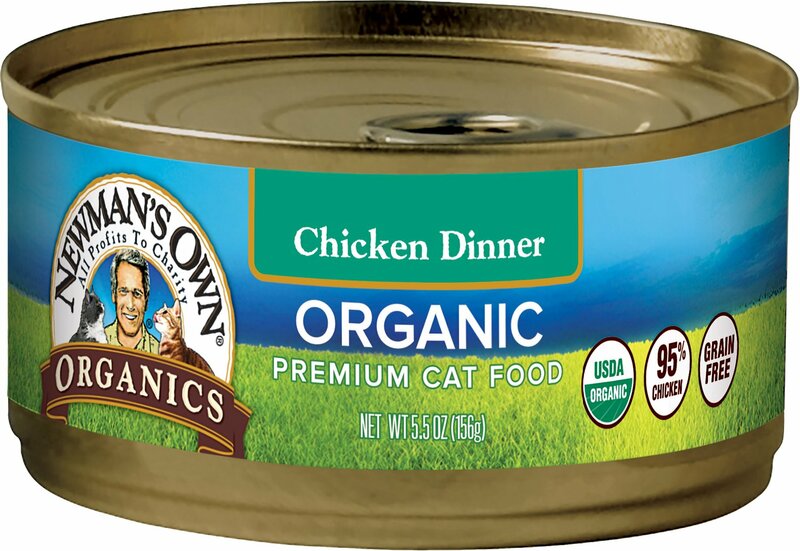 Turn meal time into nutrition time for your kitty with the Newman's Own Organics Grain-Free 95% Chicken Dinner Canned Cat Food. Made with real organic chicken as the first ingredient, it’s all the grain-free nutrition your furry one needs with all the flavor he’ll find irresistible. Your pal will love the juicy pate while he gets all the nutrients he needs, including essential amino acids like taurine, plus vitamins and minerals. It’s great as a complete and balanced diet for cats of all ages and even kittens, and can be used as a meal on its own or a delicious kibble topper. Plus, the broth is a great way to add much-needed hydration to your cat’s diet, and contains no wheat, corn, artificial colors, flavors, or preservatives. Grain-free pate is made with 95% real organic chicken for the delicious flavor your pal craves. Organic Chicken, Organic Chicken Broth, Organic Dried Eggs, Tricalcium Phosphate, Organic Guar Gum, Organic Yeast Extract, Potassium Chloride, Carrageenan, Taurine, Choline Chloride, Magnesium Sulfate, Zinc Proteinate, Iron Proteinate, Salt, Vitamin E Supplement, Copper Proteinate, Thiamine Mononitrate, Manganese Proteinate, Sodium Selenite, Niacin Supplement, D-Calcium Pantothenate, Pyridoxine Hydrochloride, Riboflavin Supplement, Vitamin A Supplement, Biotin, Potassium Iodide, Vitamin D3 Supplement, Vitamin B12 Supplement, Folic Acid. Needed to change my cats food per Vet to avoid dyes. Chose Newman’s and it’s too soon for me to know if I’ll reorder. My cat will only eat a pate style which this is. He also likes gravy. This canned food is pretty mushy so my cat likes that. He licks the juice. Not sure how much he’s eating as he also gets kibble. I will say though that his eyes no longer have that black discharge that Persians get and his poop is firm. At least he isn’t turning up his nose at this brand. Only time will tell. We have used this cat food for years, about 10 years. Over the last 3 months our 2 cats seem to have trouble finishing their measured amount of NO cat food. We have stayed with the same mix all of this time. They love chicken. We see a change in the food consistency and the smell. We are going to change to another company. My cat LOVES this Newman's Own Chicken Dinner Organic PATE. Chewy was super fast delivery! My sweet kitty is very happy with Newmans Organic canned chicken. I need to now order the crunchie dry food too. 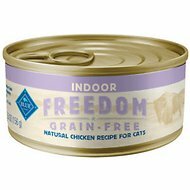 My cats all eat this food. They love the taste and this is great that ALL of them like it. This was my first purchase of this brand of cat food. I opened the first can and was really surprised to find a gray, extremely unpalatable-looking pudding-like slop. Honestly, it looked like upchuck and was much too watery (canned cat food is, out of necessity, mostly water, but this was ridiculous--I don't pay this kind of money for a can of water). My three cats were not interested in it, which was kind of a relief because it really did look gross. I donated the rest of the case to my local shelter. Our cornish rex will not eat Newman's ! Darn!! Our cornish rex will not eat Newman's ! Darn! !